As you can probably work out from the posts and hundreds of photos, I'm a huge fan of liquid eyeliner and love trying out new brands, formulas and innovative applicators. In the video above, it shows a girl arrested and applying it using handcuffs in the back of a police car - I guess demonstrating how easy it is to apply! So what's special about this eyeliner? It's longwearing, waterproof, and the shape of the nib means it hugs the lash line to give a really neat effect, with a flat tip to draw on a flick easily and symmetrically. The gel comes out the middle of the liner pen and you twist it to get the gel out. It looks really easy to use for even liquid eyeliner novices and I'm really interested to try one. This launch goes with the Benefit They're Real mascara which is a hugely lengthening and volumising mascara. Teamed together to create super impact eyes, this liner is set to be as bold and best selling as the They're Real mascara. 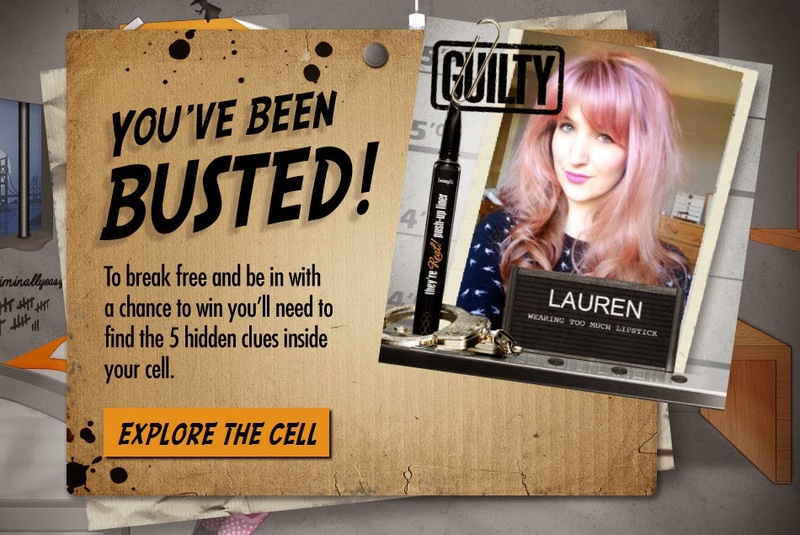 If you then head to the facebook page you can enter a competition to win a stay in an old prison and loads of freebies from Benefit! I entered here and you have to follow a quick game to be in with a chance of winning. This video was sponsored but I think it's an awesome new product to try!